The recent upheaval in Ukraine and the subsequent intervention by Russia almost escalated into a whopping international conflict, after Obama threatened president Putin with “economic isolation” (trade sanctions). It was yet another clash between the US and Russia on the political stage, after Putin earlier outsmarted Obama on Syria with a rarely seen publicity stunt — Putin wrote an op-ed for the New York Times in which he checkmated president Obama. So, what will happen next in this international tug-of-war and what will it mean for gold? Last summer, gold prices reacted heavily upon rumours that the US would intervene in Syria. Now, with the uprising in Ukraine, more or less the same happened. Gold prices climbed on rumours of a possible escalation. We also experienced higher volume on our trading platform, as gold rose to over $1,350 per troy ounce (+2% on Monday) for the first time since October 2013. Historically, there are a lot more instances in which the gold price increased significantly due to a threat or act of war. For example, gold rose to its record high (over US$800 per troy ounce) during the bull market of the 70’s when the Russians invaded Afghanistan. No surprise here; everyone grasps intuitively the intimate relation between gold and wars. Besides the instant market turmoil in asset prices that will be possibly affected, wars generally go hand in hand with excessive money printing and government spending. They are not financed by direct taxation (it’s hard, after all, to get majority support when the majority has to pay up; the inflation tax is an easy way out for warmongering politicians). 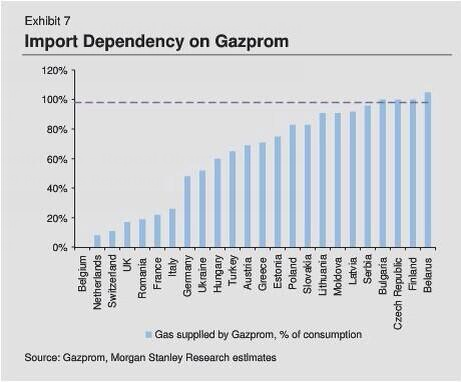 Estimates show that some European nations depend entirely on the supply of natural gas by Gazprom. Countries that depend on Russia for its gas supplies include Finland, and to a lesser extent Greece (over 70% of total gas consumption), Austria (over 70%) and Germany (near 50%). Russia currently supplies around 30% of Europe’s gas. Protectionism results in war. Why? Because natural resources are not evenly distributed over the earth’s crust. Some countries have oil, some have natural gas, and others have nothing. The beauty of a market economy is that everybody gains by international trade, but as soon as governments resort to trade barriers, currency wars and punish foreign capital, goods will cease to cross borders. Hence, shortages of certain resources materialize in countries that are not as generously endowed with resources by Mother Nature as the fortunate ones. A case in point is Nazi-Germany. “Lebensraum”, or “living space”, was a key component of the Nazi ideology. Hitler admitted that Lebensraum was not about the superiority of the Aryan “master race”, but a mere tug-of-war for scarce resources, or as Hitler himself puts it: “... [we] cannot feed ourselves from our own resources.” Because Germany has few natural resources at its disposal, it depends on foreign imports and open markets for its material necessities. In sum: if gas ceases to cross borders, armies will. And the tug-of-war for resources in the former Soviet Bloc will not be any exception. As the risk of “gas supply disruptions” increases, the function of gold as “insurance” becomes very clear. When Gazprom turns the taps off, gold is poised for a swift gain. That aside, the tense relation between Russia and the West seems reason enough for governments to do what they do best: print money and spend it on military quagmires. It is, arguably, not a mere stroke of luck that the correction in gold prices of the past two years coincided with less military spending by the US. Military lobbyists can now breathe a sigh of relief, as the US has yet again a reason (or excuse) to bolster its military complex. For the moment Europe and the US seem to take some Ukrainian fiscal distress away by means of a bail-out. They will undoubtedly urge Ukraine to pay its invoices to Gazprom. As a result, things might appear calm on the surface, but current international relations are fragile and can go awry any time. Conflicts between Russia and Ukraine can lead to gas supply disruptions in a matter of days. If you read nothing but these closing lines, you have gained an invaluable lesson: monetary recklessness leads to fiscal imprudence, fiscal imprudence leads to economic hardship, and economic hardship generally leads to trade barriers and protectionism. Trade barriers lead to war. War is good for gold. Gold investors are well advised to maintain a long-term investment in gold as insurance for assured future tensions on the political stage. However, one should strongly advise against buying gold after conflicts heat up. In many cases conflicts do not escalate and will draw investors into buying gold at inopportune times. A next episode in such conflicts might be years away, in a future far beyond the investment horizon of most investors. A shrewd investor, therefore, makes sure to hoard gold in times governments are more eager to engage in war. When the domestic economy tanks, foreign enemies are easily made, as governments love to divert the public’s attention away from the real issues. We live — again — in dangerous times today, so make sure not to arrive late at the party: the coming years there is more to come.